Review article from Prof. Sang Ouk, Kim group was published in 25th anniversary of Advanced Materials. 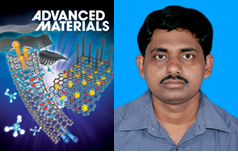 Uday Narayan Maiti, a post-doctor fellow (laboratory of Prof. Kim, Sang Ouk) published review article for 25th anniversary of Advanced Materials. This paper was selected as inside front cover and the title is “Chemically Modified/Doped Carbon Nanotubes & Graphene for Optimized Nanostructures & Nanodevices”.